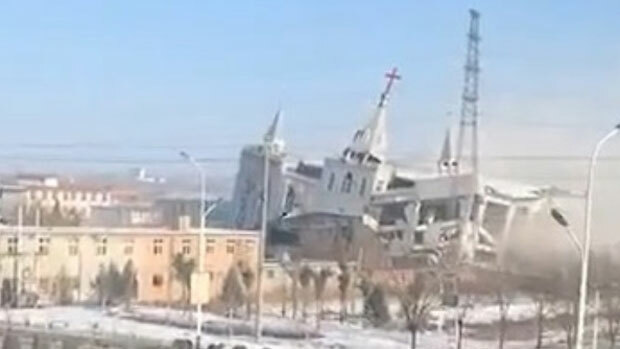 Golden Lampstand Church in Linfen, Shanxi, China’s northern province, was demolished this week. It is the second in less than one month, sparking fears of a wider campaign against Christians as authorities prepare to enforce new laws on religion. According to RadioFree Asia, Chinese military police detonated explosives situated in underground worship halls beneath the church and proceeded to demolish its above-ground building, leaving it shattered. A pastor at a nearby church, who asked to remain anonymous, arrived after the blast at the Golden Lampstand church and watched construction crews break apart the remains of the building. There were “more police than I could count” preventing a crowd on onlookers and worshippers from approaching the site, the pastor said. The Golden Lampstand church was built a decade ago and has around 50,000 members. This is not the first time the church has faced persecution. Hundreds of police and hired thugs smashed the church and seized Bibles in an earlier crackdown in 2009, when the church was being built. Church members who slept at the construction site were awakened by 400 officials and beaten as the building was razed. Many of them reached critical condition. The incident ended with long prison sentences, big fines, and even an arrest in a re-education labor camp for the leaders of this church.They were accused of “illegally occupying farmland and assembling a crowd to disturb traffic order”. China appears in position 43 on the 2018 World Watch List, made public this Wednesday by Open Doors. "Local authorities seem to be becoming more restrictive by emphasizing communist ideology and limiting the space in which churches can operate", Christian advocacy group, China Aid, points out. “This might be a new pattern against any independent house churches with an existing building or intention to build one. It also could be a prelude to enforcing the new regulation on religious affairs that will take effect in February”, says Bob Fu, founder of China Aid. It is estimated that there are some 97 million Christians in China, many of whom gather in independent congregations such as the Golden Lampstand. The surging popularity of non-state-approved churches has raised the ire of local authorities, who are wary of any threats to the party’s rigid political and social control. China guarantees freedom of religion on paper, but in practice local authorities often use technicalities to attack unregistered churches. Charges of land or building violations and disturbing the peace are among the most common. Despite pressures and difficulties, Chinese churches continue to grow, not only in China, but also outside its borders, in the large Chinese communities throughtout the world. Thus, in nearby countries such as South Korea or the Philippines, Chinese evangelical churches are growing exponentially, as revealed by The Economist in a recent report. This growth in evangelical Christianity also occurs among Chinese in Muslim- majority countries such as Indonesia or Malaysia.